Sociedad Deportiva Aucas (Spanish pronunciation: [sosjeˈðað ðepoɾˈtiβa ˈaukas]), also known as "Papa Aucas", is a football club based in Quito, Ecuador. They play in the top tier of Ecuadorian football and have spent the majority of their history in the top-flight Serie A. The team is amongst the most popular in the city because of its long history in the Serie A. Despite the popularity, Aucas has never won an Ecuadorian championship. The team is named after the Auca tribe, who are also called Huaorani. The club originally belonged to Royal Dutch Shell, which had been operating oil fields in the east of Ecuador where the Aucas live. The club's main uniforms colors, yellow and red, were taken from the colors used by Shell to market their products and services. The alternate uniform is gray, except for the commercial advertisements and numbers and names of players, which are red. 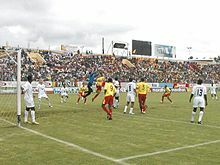 Players who have played for Aucas include Argentinian and nationalized Ecuadorian forward Ariel Graziani, forward Nicolás Asencio, forward Agustin Delgado, forward Édison Maldonado, Ecuador international defender Giovanny Espinoza, and the 1990 FIFA World Cup Colombian goalkeeper René Higuita. This page was last edited on 6 April 2019, at 01:00 (UTC).